Mac OS X includes a built-in web server, but it only enables you to host and test a single website. Although technically oriented Mac users will be fine digging around in hidden directories and editing files to manage virtual hosts, that's beyond the capabilities of many web designers. 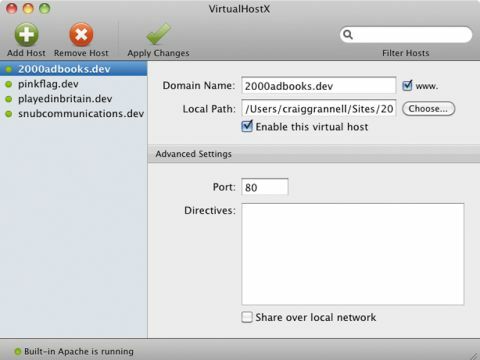 VirtualHostX does away with such problems, enabling you to create a local domain name and choose a local path for each of your development websites. For example, you might store development files for mywebsite.com in /Sites/mywebsite/ and use the development domain name mywebsite.dev for testing in browsers. Changes to virtual hosts are applied by clicking Apply Changes and typing a password when prompted. VirtualHostX earns further Brownie points in several ways. First, it encourages you to back up your existing server settings, plus amended settings can be backed up or restored at any time. If you prefer MAMP or XAMPP to Apple's built-in server, VirtualHostX can deal with that, and advanced users can add custom directives. And via a simple checkbox you can share your hosts with other users on the same local network. The foolproof nature of VirtualHostX coupled with its affordable price means it's a no-brainer for Mac-based web designers working on multiple sites. But even if you're technical and don't mind poking around config files, VirtualHostX still comes recommended, purely from a timesaving perspective.